When I read that the post-rock, Icelandic band Sigur Rós commissioned Melika Bass to direct and produce a music video for their composition, "Varðeldur," I wasn't terribly surprised. Bass' archetypical characters and magical components cohere with the subliminal sound that is the framework of Sigur Rós. The ethereal and red-headed character for "Varðeldur" appears as another one of Bass' character studies. In her current solo exhibition at the Hyde Park Art Center in the Kanter McCormick Gallery, Bass presents a reoccurring character, as well as two male characters, who share similar professions but all live different lives. The Latest Sun is Sinking Fast introduces familiar faces (if you're a Bass fan) and continues and expands on the past and present. The characters connect visually, thematically, professionally, and fictionally, throughout the installation-based exhibition at the HPAC. Archaic and modern, the characters crawl through bushes, bath in public restrooms, listen to sermons on an iPhone and work in their tool shed. The juxtaposition of the two females versus the two males creates a visually impacting environment due to the strong gender roles and constant conversation of religion. The female character, played by the same actress, is Nanty, and has been a recurring vision in Bass' work. In one projection she has brown hair, in the other, red. The aphotic eyes of Nanty appear lucid and disoriented. 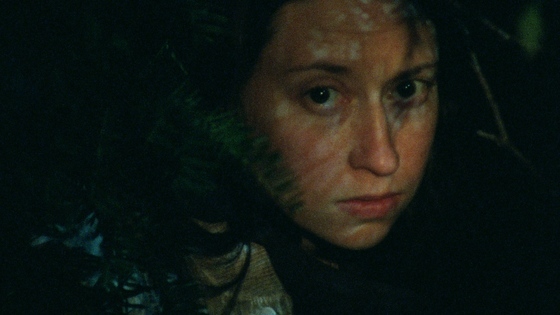 She is concentrated but adrift as she washes behind her ears in one scene and conceals herself behind limbs of bushes and branches in another. The viewer is invited to intimately see Nanty with red hair -- and the other half, with dark hair, cowers and crouches like a feral animal behind natural obstructions. The viewer wrestles through the observation of the four screens that project four different scenes, four different sounds, and four different characters. By super-imposing image, sound, and story, Bass spawns sensory pleasures which guide viewers around the mesmeric space. Chock full of religious symbols such as water, ritual and homily, Bass alludes to her familial background which is composed of ministers and Christianity. Melika Bass also encourages her actors and characters to appear natural and true in form while behind the camera. She stated that one character fell asleep in the 2008 film, Songs from the Shed, and her camera crew began filming, thinking, "This is exactly what we wanted"! The Latest Sun is Sinking Fast will be on display until April 19 when a closing reception will take place from 2-4pm. Admission is free. The Hyde Park Art Center is located at 5020 S. Cornell Ave.